The unified Korean canoeing team won a historic medal in women's 200-meter dragon boat racing at the 18th Asian Games on Saturday. 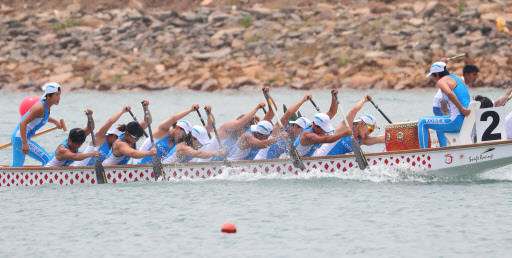 The 12-member dragon boat racing team earned bronze in the women's canoeing traditional boat race after finishing third among six contestants at the Jakabaring Rowing & Canoeing Regatta Course in Palembang, Indonesia, the co-host city of the Asian Games with Jakarta, with a time of 56.851 seconds. China won gold at 56.161 while Indonesia took silver at 56.817. This is the first time that a joint Korean team medaled at an international multi-sport competition. The medal will count to neither South Korea nor North Korea in the Asian Games medal standings. Instead, it will be awarded to "Korea."